Sir Lawrence Alma-Tadema was one of the most renowned painters of late nineteenth century Britain. Born in Dronrijp, the Netherlands, and trained at the Academy of Antwerp, Belgium, he settled in England in 1870 and spent the rest of his life there. A classical-subject painter, he became famous for his depictions of the luxury and decadence of the Roman Empire, with langorous figures set in fabulous marbled interiors or against a backdrop of dazzling blue Mediterranean sea and sky. Universally admired for his superb draftsmanship and depictions of Classical antiquity, during his life time, he fell into disrepute after his death and only in the last thirty years has his work been reevaluated for its importance within the nineteenth century English art. 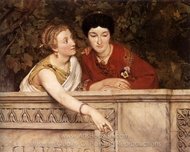 Sir Lawrence Alma-Tadema was arguably the most successful painter of the Victorian era. 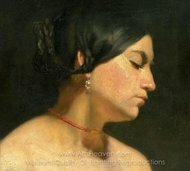 For over sixty years he gave his audience exactly what they wanted: distinctive, elaborate paintings of beautiful people in classical settings. His incredibly detailed reconstructions of ancient Rome, with languid men and women posed against white marble in dazzling sunlights provided his audience with a glimpse of a world of the kind they might one day construct for themselves at least in attitude if not in detail. Being a creature of his time, when the Victorian period ended so did his marketability. 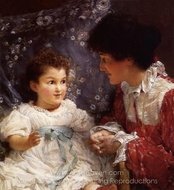 By the end of his career, art such as Alma-Tadema�s was no longer appreciated as it had been before. New movements in art had begun and his imagery, which was thought of as Victorians in togas, fell out of favor. 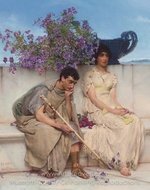 The end of Alma-Tadema's life saw the rise of Post-Impressionism, Fauvism, Cubism and Futurism, of which he heartily disapproved. As his pupil John Collier wrote, 'it is impossible to reconcile the art of Alma-Tadema with that of Matisse, Gauguin and Picasso. Alma-Tadema's output decreased with time, due in part to ill health but also to his obsession for decorating his new home where he moved in 1883. Nevertheless, he continued to exhibit throughout the 1880s and into the next decade, receiving a plentiful amount of accolades along the way, including the medal of Honor at the Paris Exposition Universelle of 1889, election to an honorary member of the Oxford University Dramatic Society in 1890, the Great Gold Medal at the International Fine Arts Exposition in Brussels of 1897. In 1899 he was Knighted in England, only the eighth artist from the Continent to receive the honor. Not only did he assist with the organization of the British section at the 1900 Exposition Universelle in Paris, he also exhibited two works that earned him the Grand Prix Diploma. He also assisted with the St. Louis World�s Fair of 1904 where he was well represented and received. 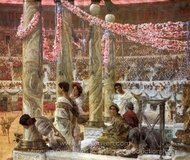 During this time, Alma-Tadema was very active with theater design and production, designing many costumes. He also spread his artistic boundaries and began to design furniture, often modeled after Pompeian or Egyptian motifs, illustrations, textiles, and frame making. His diverse interests highlight his immense talents. 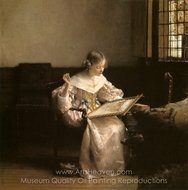 Each of these exploits were used in his paintings, as he often incorporated some of his designed furniture into the composition, and must have used many of his own designs for the clothing of his female subjects. Through his last period of creativity Alma-Tadema continued to produce paintings, which repeat the successful formula of women in marble terraces overlooking the sea such as in Silver Favorites (1903). Between 1906 and his death six years later, Alma-Tadema painted less but still produced ambitions paintings like The Finding of Moses (1904). On 15 August 1909 Alma-Tadema�s wife, Laura, died at the age of fifty-seven. The grief-stricken widower outlived his second wife for less than three years. His last major composition was Preparation in the Coliseum (1912). In the summer of 1912, Alma Tadema was accompanied by his daughter Anna to Kaiserhof Spa, Wiesbaden, Germany where he was to undergo treatment for ulceration of the stomach. He died there on June 28, 1912 at the age of seventy-six. He was buried in a crypt in St. Paul�s cathedral in London.